Oh, but there are so many ways that the plaintiff was going to lose this lawsuit, and whether camouflage can have secondary meaning is so ordinary. I’m going to talk about the much more interesting one, breach of contract. Plaintiff Crye Precision LLC is the exclusive licensee of patents for camouflage patterns (the owner, Lineweight LLC, is an IP holding company). In 2008 Defendant Duro Textiles became its exclusive US distributor of one of the patterns, MULTICAM, for two years. Duro could sell to the military and commercially. Intellectual Property. [Duro] acknowledges and agrees that it will not disassemble, decompile, or reverse engineer MULTICAM or any other intellectual property right of CRYE, including patent, trademark and copyrights, licensed from CRYE or, during or after the term or expiration of this Agreement, make any products that are similar to MULTICAM through color palette, pattern or arrangement or placement of any elements incorporated in MULTICAM. Furthermore, [Duro] agrees that it shall not make any additions to, new renderings of, or modifications, embellishments, derivative works or other changes of or to MULTICAM or any other intellectual property rights of CRYE without CRYE’s prior written consent and [Duro] agrees that all such additions, renderings, modifications, embellishments, derivative works or otherwise shall be and remain the sole property of CRYE. (Emphasis added by the court.) So – wow. It stretches the imagination to think of a way one could print a camo pattern that Crye wouldn’t think breached this provision. Color palette OR pattern OR arrangement OR placement of elements OR additions to OR new renderings of OR modifications OR embellishments OR derivative works OR other changes. Duro, what were you thinking? Thereafter the US government created its own camo pattern called “Scorpion W2 and patented it. The Scorpion patents were allowed over the Crye patents, expressly discussing the difference between the two. In 2014 the US government announced it was switching patterns. As you probably guessed, Duro became one of the government suppliers of the Scorpion W2 pattern, selling only to government contractors and subcontractors, not commercially. The 2012 Crye-Duro agreement expired and the parties could not come to terms on a new agreement. Crye sued Duro and the claims remaining are that the sale of the Scorpion W2 fabric was a breach of the 2012 contract and for misappropriation of the MULTICAM trade dress under state and federal law. Duro’s defense to the breach of contract claim was that the provision is unenforceable, which is where I think it gets interesting. I assumed freedom to contract ruled; if you’re stupid enough to sign up for the above provision in a contract, which essentially prohibits you from ever selling any other camouflage pattern, that’s your business. Turns out, I was wrong. Courts typically consider three factors to determine the enforceability of non-compete covenants in ordinary commercial contracts: (1) whether the covenant protects a legitimate business interest; (2) the reasonableness of the covenant with respect to geographic scope and temporal duration; and (3) the degree of hardship imposed upon the party against whom the covenant is enforced. The application of these factors depends entirely on the totality of circumstances. [A]ccepting that each of these identified business interests entitles Crye to a degree of protection, § 3(h) is impermissibly broad in scope and unduly burdensome. 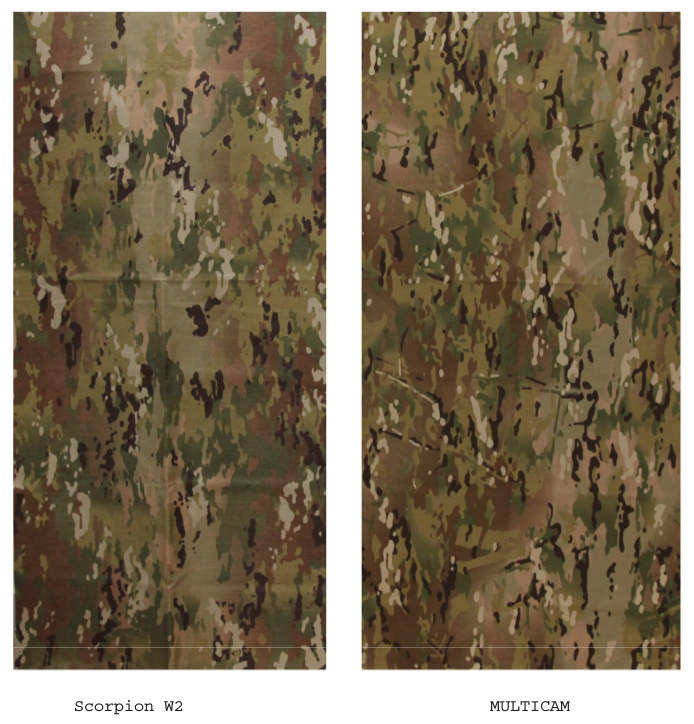 Section 3(h) does not simply cover camouflage patterns that infringe on Crye’s intellectual property rights in MULTICAM, but extends as well to patterns that are “similar” to MULTICAM. Section 3(h) provides no criteria to provide notice of what Crye considers to be similar. It provides that any product similar to MULTICAM through “color palette, pattern or arrangement or placement of any element incorporated in MULTICAM” made by Duro is prohibited. This provision is impermissibly vague and overbroad. If enforced to its extreme, Crye could prevent Duro from printing any camouflage pattern. Moreover, § 3(h) has no limits on its geographic scope or temporal duration, which places its burdens on Duro anywhere in perpetuity. Whether to protect Crye’s licensing program, safeguard the MULTICAM patent, or otherwise, § 3(h) is far broader than necessary and is unreasonable. [E]ven assuming these patterns are similar and the first three Polaroid factors weigh in Crye’s favor, there is no likelihood of confusion associated with Duro’s sales of Scorpion W2 to the government. The Government is the creator and only purchaser of Scorpion W2. It is a sophisticated consumer, as its creation of Scorpion W2 and its announced switch from MULTICAM in 2014 evinces. But I alluded to other ways to lose – certainly the distinctiveness of the pattern is a huge hurdle for a pattern that was the standard pattern for military uniforms. Functionality another one; camouflage patterns aren’t just pretty but are designed to hide, as evidenced by the utility patent on the Scorpion W2’s pattern. Similarity of the designs was assumed by the court, but in the grand scheme of camouflage patterns these may be quite different. To the extent the claim is against a company in the role of contractor to the government the relief is limited; indeed, Crye’s voluntarily dismissed its first suit because it had pled itself into the Federal Court of Claims with it and this complaint was an effort to skirt the problem – which I’m not sure it actually accomplished when all of Duro’s sales were for Army uniforms. But who am I to say. Notice of appeal filed, Court of Appeals, 2d Circuit, 16-1333. Crye Precision LLC v. Duro Textiles, LLC, No 15cv1681 (DLC) (S.D.N.Y. April 22, 2016).